As part of its mission to bring writers and readers of speculative fiction together, Clarion West holds a number of events throughout the year. Each week during the summer workshop, Clarion West presents one of its six instructors reading their best new work which could include selections from recently published books, unpublished stories, or novels-in-progress. The featured reader also answers questions about writing, teaching, editing, and other topics. The Write-a-thon is Clarion West’s six-week-long annual online fundraiser. Participants set public writing goals on their personal Write-a-thon page, then work toward them. Friends and family can pledge donations in support. It’s like a walkathon, but with writing. 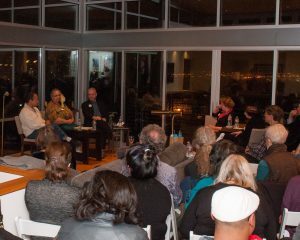 From time to time, Clarion West brings together authors and the public for the opportunity to interview prominent writers in both intimate and public settings. When possible, Clarion West teams up with other organizations to make this happen. 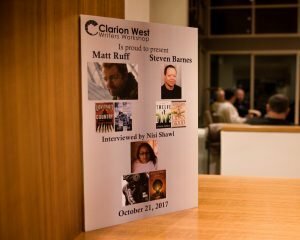 Last fall, Clarion West brought together Matt Ruff and Steven Barnes at an intimate evening to discuss their recent works, writing for film and television, and delve into the arcane art of frightening people into greater understanding. 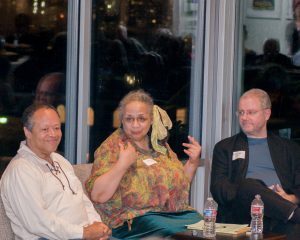 The event was moderated by author Nisi Shawl and held at a private residence in Seattle. Stay tuned for another great event this fall – details to be announced soon! This July, Clarion West is teaming up with the Wing Luke Museum to interview Yoon Ha Lee on Sunday, July 1st at 2pm. In 2018, Clarion West held it’s first open mic event at Naked City Brewing. The event included an hour of open mic operated by Two Hour Transport, a raffle of collectible SF/F items, and special guest readers Randy Henderson, Seanan McGuire, Evan Peterson, and E. Lily Yu. Stay tuned for another event in 2019.